This is an intriguing assortment of promotional video clips, all in high quality. 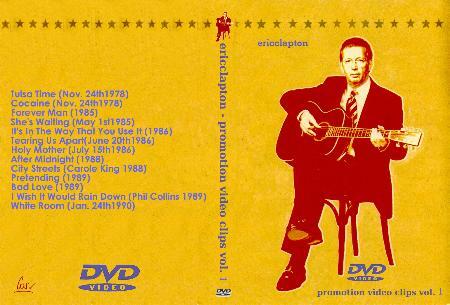 The compilation begins with a couple performances from the never-officially-released (for good reason) document of EC's 1978 tour, "Eric Clapton and His Rolling Hotel". This is proof that, somewhere in the bowels of Warner Music Japan, there exists a clean master of this wretched document of excess. The quality of these two numbers alone makes this compilation a worthwhile acquisition. Other than some fairly commonplace vldeo promotion clips, another interesting addition here is the performance of "She's Waiting" from the Warner Japan release of the 1985 Tour document, Live '85 / Live Now. This performance was not shown on its entirety on the US release, instead only being edited into the closing credits. It was included in the Japanese domestic laserdisc release (along with performances of "Same Old Blues" and "Wonderful Tonight", also absent from the US release), but the intriguing thing about this clip is that it is letterboxed in a theatrical aspect ratio, while the official video released was provided in a 4x3 pan-and-scan format. One minor quibble with an otherwise worthy compilation would be that the version of Phil Collins' "Rain Down" included here is the short, music-only version. Well done, and top quality from S-VHS or better masters (with the exception of the Carole King clip). Nicely authored with menus and chapter menu.